I was reading this post over at Amazin’ Avenue about the worst Opening Day lineups in Mets history (a story prompted by the lineup we may see on April 1st this year). They arranged it by decade. When I got to their nominee for worst lineup of the 70s, I stopped – and a flood of memories came back. 1979 was the year I first year I started following the Mets in earnest. I had watched them on and off in ’77 and ’78, but at the time, my life was about Star Wars and surviving first grade. For whatever reason, the ’79 team caught my attention, maybe because I was playing little league by that time. Why was I a Mets fan? My older brother was a Mets fan. Why was he a Mets fan? Because they weren’t the Yankees. And I shared his contrarian attitude. It seemed like every kid in my class was a Yankees fan, and I didn’t want to join the crowd. So, I watched the 1979 team lose 99 games (I remember listening to the last game of the year on the radio and exulting in the fact that they avoided their 100th loss). They were bad. Everybody knew they were bad. But I hung on every pitch all year, and got extremely upset when they lost – which was frequent. 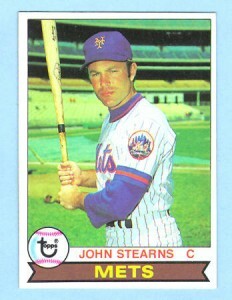 John Stearns was my favorite (the cleanup hitter who hit 9 home runs that year) because he seemed to give a damn about the team, no matter how bad they were. Mazzilli had a good year (.303/.395/.449 with 15 HRs), and should have, in my estimation, won the MVP of the All-Star Game that year, when he drove in both the tying run (with a solo homer) and the winning run (with a bases-loaded walk). Willie Montanez was terrible that year, but I loved how he styled around the bases when he hit a home run (which was rare for him in ’79). Frank Taveras (who would become the every day shortstop), acquired in a trade from the Pirates for Tim Foli, was fun to watch as he stole bases, but I wasn’t attuned to things like on base percentage, an area in which he didn’t exactly excel. Craig Swan won an ERA title that year. You could say that Swan and Mazzilli each had career years. And I’ll always remember Steve Henderson for his walk-off homer – in 1980 – that Greg Prince writes beautifully about here. But they were still terrible. I’m not sure why I ever liked this team. Is this team responsible for my dark moods and pessimism, or was I always like that, and that’s why I like the Mets? I’d like to think that I started following this team because I’m an independent thinker who always roots for the underdog, but could I have been that deep at 8 years old? All those years of suffering made it so much sweeter when the Mets won it all in 1986. I felt good for players like Mazzilli and Mookie Wilson who experienced post-Seaver lean years. I felt like they had really earned it. And as a fan of those teams, I felt like I earned it too. This is the part where I say today’s Mets will have a day of redemption like the teams of my childhood, and all we’ve been through with this team will finally pay off. Whether it happens or not, as fans, we will have earned it this time as well. Appreciate the kind words regarding Steve Henderson and 1980, Paul. I keenly remember Opening Day 1979 as well (it’s one of the 500 Mets wins I’m revisiting in the Happiest Recap book series — in the second volume, which will be out in the near future), including the final out being secured by the raw rookie Jesse Orosco, flying out feared veteran batsman Bill Buckner. Kudos to anyone who started with the ’79ers and hung in there for the long haul. Funny, ’79 was the year I first really committed to the Mets — and like you, it’s hard to understand why. Up to that point, I watched and rooted for both the Mets and the Yankees — hey, I didn’t know any better! — and followed the Yankees more closely because a) they were on TV more often and b) they were more interesting to watch. Can you blame a 7- or 8-year-old, when asked to choose between watching Roy Staiger or Graig Nettles? Bruce Boisclair or Reggie Jackson? Kevin Kobel or Ron Guidry? Like you, Stearns was my favorite Met — with Jerry Grote a close second (though by ’79 he was in LA) — and after Thurman Munson (my favorite MLBer, period) passed in August ’79, my allegiance to the Mets quickly ensconced. That year I remember, in addition to Stearns (and his NL record for SBs by a backstop): Montanez as the ultimate hot dog; Jose Cardenal joining the team in between games of a doubleheader with the Phillies; Lindsay Nelson rave about the strong arm of young catcher Alex Trevino; Gold Glove-caliber fielding by Doug Flynn; Neil Allen beginning as a starter, then emerging as a bonafide closer; Elliott Maddox awkwardly filling in at 3B; and a strange, unexplainable devotion to Joel Youngblood. Looking back at that roster, that bullpen could have been AMAZING had they left it intact — Allen, Jeff Reardon, and Jesse Orosco? Wow. And Juan Berenguer turned out to be a pretty good swingman for the Tigers a few years later (no, let’s not discuss Mike Scott). Thanks for the walk down memory lane, Paul! Glad I’m not the only one. I remember Jeff Reardon moving on and becoming a star elsewhere, and lamenting our bad luck. If I had only known what the next thirty some-odd years would be like! Loved your memories, Joe. I forgot about Maddox at third!